Bassist Lisa Mezzacappa had a good idea when she thought of what she would do for her first album as leader: she took some musical fragments played by artists she had especially admired, the Art Ensemble of Chicago, Dolphy, Ayer, Ornette, Kirk, Sun Ra, and built performance pieces out of them. There are also good cover versions of Captain Beefheart’s “Lick My Decals Off, Baby,” (it stays in the mind) and Steve McCall’s “I’ll Be Right Here Waiting.” Then she chose to work with musicians she had long associated with: Aaron Bennett, tenor, John Finkbeiner, electric guitar, and Vijay Anderson on the drums. 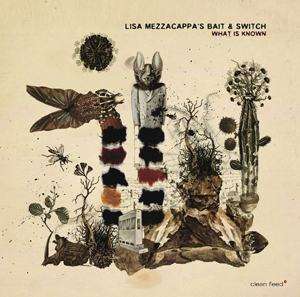 Into the studio and now out comes What is Known (Clean Feed 192) by Lisa Mezzacappa and Bait & Switch. The pieces hang together well. The band does too, via better living through (musical) chemistry and because in part they know each other musically from long association. Bennett’s tenor is raucous and energized, Finkbeiner plays some abstract and electric lines worth your ears’ attention, Lisa M. has a forcefully strong tone and convinces with what she does. Vijay plays as a group member. What he does is right and it’s thought through. Now perhaps one could say that about alot of bands but in this case the material Lisa has put together moulds the end result to be smart, varied and quite stimulating. This is a really nice first album and it plays repeatedly in my musical listening cycle right now. Definitely recommended for some worthwhile and very modern jazz improv!